Spectron shares in success as Huygens probe makes triumphant landing on Titan! 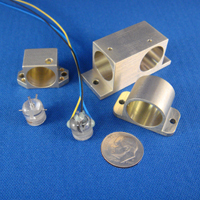 The SH 50050 Ceramic Series of single axis Electrolytic Tilt Sensors utilize advanced ceramic materials, bonded together with glass, resulting in a rugged hermetically sealed package. The 96% alumina material body is molded and machined into precise dimensions, that determine range, sensitivity, and dynamic response. The body also incorporates a reference surface for easy mounting and even heat transfer for uniform thermal stability. 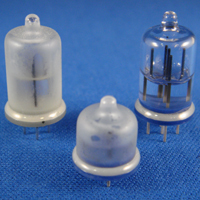 Electrolytic tilt sensors are non-signal conditioned sensing elements. 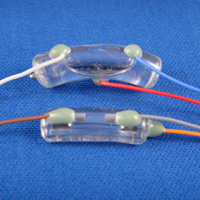 Spectron has four series of tilt sensors available, including single and dual axis versions. 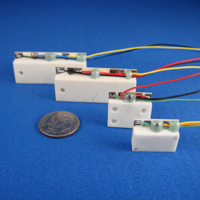 Our single axis electrolytic tilt sensors are available in full scale ranges from +/-0.25 degrees to +/-80 degrees, in both glass and ceramic construction. The RG and CG Series Electrolytic Tilt Sensor is designed for extremely high accuracy measurements over shallow angular ranges, and in dynamic conditions. The L-Series Electrolytic Tilt Sensor provides unparalleled accuracy for wider angle measurements. The SH50050 Ceramic Series Electrolytic Tilt Sensors provide a high accuracy/lower cost alternative for both shallow and wide angle measurements. For dual axis measurements, the SP5000 and AU6000 Series Electrolytic Tilt Sensors afford price, performance, quality and exceptional reliability. Geared towards the OEM marketplace, these tilt sensors feature a PC board mountable design, no moving parts, and a symmetrical pin design which eliminates installation orientation concerns. For those seeking a complete tilt sensing solution, Spectron offers a full line of both single and dual axis signal conditioners, which are designed to interface perfectly with all of our electrolytic tilt sensors. * Sensors also available installed into customer supplied housings. Consult factory for details! * Sensors also available installed into customer supplied housings. * Also available in an OEM single axis version. Consult factory for details! * Specifications are subject to change without notice!